Laughter, whistles and loud applause. 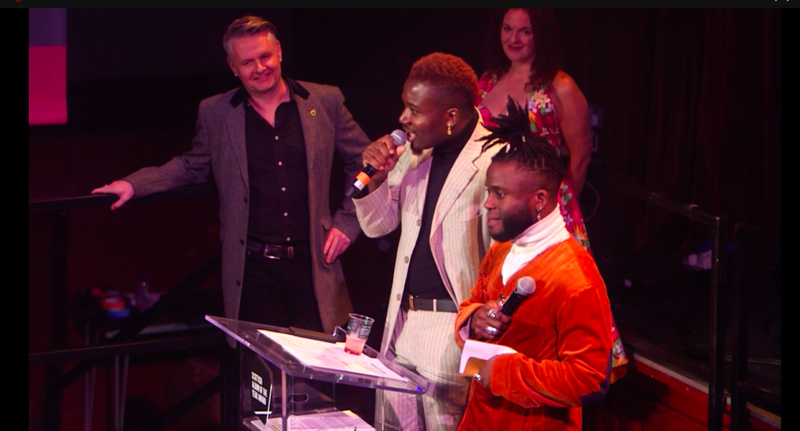 Young Fathers have won the Scottish Album of the Year Award 2018 and both the judges’ decision and the joke go down happily with all genders in the large (and largely white) crowd filling Paisley Town Hall. The winners also look and sound delighted as they jostle to find their verbal balance. They hadn’t prepared a speech, they weren’t expecting to win. The first group to secure the SAY Award twice (the Edinburgh-based trio won it in 2014, the same year they won the Mercury Prize) can claim to have made history. And to make it in Scotland is something special. The audience erupts again. Cocoa Sugar is the undisputed album of the year. Love is in the air. Diversity, however you define it, is the theme of the night. Once again the SAY Award has demonstrated the extraordinary wealth and variety of musical talent in Scotland. And if there was no jazz or classical in this year’s longlist, there is an almost bewilderingly diverse display of some of the freshest and best of contemporary Scottish music for the judges to work their way through – and for the rest of us to enjoy in the live music performed on stage. It’s a sparkling and intoxicating mix: the mood, the music and the generous camaraderie. Competitive of course – the first prize, after all, is £20,000 – but consistently ‘collaborative’ too. Collaboration is the word that keeps cropping up as the ten shortlisted artists line up – Mogwai, Franz Ferdinand, Karine Polwart with Pippa Murray, and Conflats collaborators Kathryn Joseph, James Graham and Marcus Mackay among them – to receive their £1,000 (and mysteriously boxed, large piece of artwork). The evening is charged with the positive energy that drives so much of Scotland’s collaborative creativity. In fact – the thought occurs to me looking round the many generations of music fans in the Victorian building – if you could bottle the spirit of this moment, Scotland would come up with a can-do elixir more powerful than any whisky – or even the ‘illicit gin’ cocktail fired up for the night with chilli syrup. But there is also a poignant undertone. This was Paisley’s third and final (for now anyway) hosting of the SAY Award. At last year’s ceremony the town was charged with anticipation of the benefits that would come if they won City of Culture 2021. Three months later that prize went to Coventry and this year, though Paisley’s civic pride persists, the spotlight of anticipation beams elsewhere. Now the focus is on Dundee. A week after the SAY Award ceremony, the new V&A opened to a tidal surge of media attention on the Tay, and Primal Scream headlining the 3D festival launching Scotland’s first design museum. The big name Glasgow band combined with Dundee’s up-coming Be Charlotte (who featured in last year’s SAY Award programme) and new visual work by Jim Lambie, plus graffiti and Beano comic cuts. I wasn’t in the Dundee audience, but the excitement made its way across the airwaves, inviting a digression. From critical reviews it seems as if Paisley’s town plan has stood the test of time better than Dundee’s waterfront development. The walk between Gilmour Street Station and Paisley Town Hall reveals grandeur bequeathed by 19th century textile barons, and not yet obscured by ugly 21st century opportunism. The visitor arriving in Dundee is confronted with ‘the worst kind of ill-considered British “regeneration”, disparate buildings emerging on adjacent plots with apparently no coherent plan’. Edwin Heathcote in the Financial Times ‘The new railway station-hotel combo is ghastly’ Will Gompertz, BBC. Time will tell if Kengo Kuma’s building will do for Dundee what Frank Gehry’s Guggenheim has done for Bilbao. But there’s no doubting what the creative industries already do for Scotland. According to Creative Scotland the sector contributes £4.6bn to the Scottish economy and employs more than 73,000. It stimulates new business and brings new visitors – music tourism alone generates spending of at least £295m in Scotland each year, creating an estimated 3,200 jobs (new research suggests live music attendance in Glasgow is worth more than £159m sustaining more than £1,140 full time jobs in the city). It’s a dynamic sector, dominated by small companies – 88% have fewer than five employees, and more than half are sole traders – accounting for many people on stage in Paisley Town Hall and probably quite a few folk on the dance floor too. That breeds and encourages the collaboration evident in so much of the exciting new work presented at the award ceremony. But it’s not easy to survive in a tough environment and SAY Award organisers, the Scottish Music Industry Association, have an ambitious mission to invest in the essential infrastructure to nurture and sustain a lasting industry. Here’s a closing thought. Paisley and Dundee are at what Guardian columnist John Harris calls the cutting edge of modern Britain, striving for new purpose and prosperity in our post-industrial era. Both the V&A and the Say Award celebrate something of vital importance to the quality of life in Scotland: the enormous range of creative skill and talent to be found from coast to coast. From north to south. From Scots who were born and raised here or, like Aloysius Massaquoi, are proud to call it home.